The A4 compendium can be customised by screen printing your company logo onto the beautiful PU leather finish or alternatively you can have the metal badge printed or engraved for a more subtle effect. 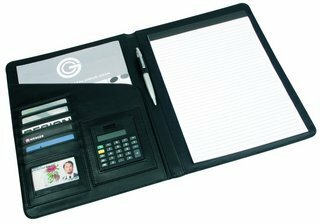 If you are looking for a quality promotional gift item to offer your clients you can't go wrong with these compendiums; including an A4 lined pad of 50 pages, a dual powered calculator, card sleeves and pen holder. The pen shown in the image is not included.